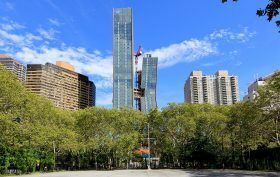 The highly anticipated three-story sky bridge that links the two American Copper Buildings officially opened on Wednesday, making it the first of its kind in New York City in more than 80 years. 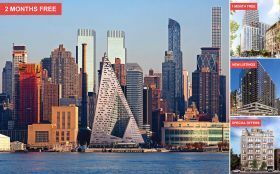 In a collaboration between SHoP Architects and JDS Development Group, the pair of copper-clad luxury rental buildings at 626 First Avenue, known for their slanted silhouettes, began leasing earlier this year. And now, the buildings’ swath of amenities have been unveiled, including the 100-foot-long sky bridge that is suspended 300 feet in the air and boasts a 75-foot indoor lap pool, hot tub and a bar and lounge for residents. 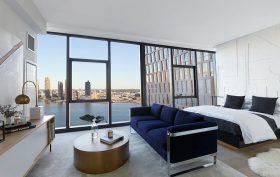 The team behind the American Copper Buildings–JDS Development Group and SHoP Architects–teased a few interior renderings of the rental back in August, but now the project’s full site is live and there’s a slew of images of the SHoP-designed model apartments, as well as never-before-seen renderings of SCAPE Landscape Architecture’s courtyard plaza. Along with these new views comes news from Curbed that though listings for the 600 market-rate units aren’t available yet, (160 others became available through an affordable housing lottery) rents will start at $2,800/month for studios, $4,100/month for one-bedrooms, and $6,800/month for two-bedrooms. 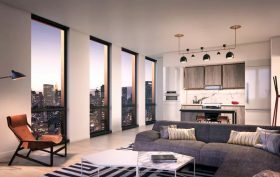 After last week’s rush of news surrounding the American Copper Buildings–the launch of its affordable housing lottery for 160 units and the first reveal of its interior renderings–6sqft decided to take a tour inside the SHoP Architects-designed project. 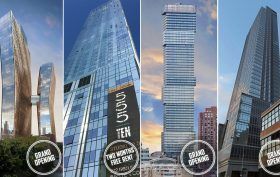 JDS Development Group‘s dancing East River towers have become best known for their copper facade (made up of 5,000 metal panels) and its three-story, amenity-filled skybridge that hovers 300 feet above the site at 626 First Avenue. 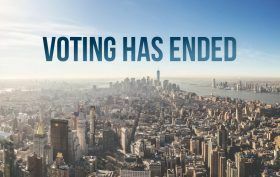 Not only did we walk through the bridge, but we also took a peek at the buildings’ already greening copper patina, had a first look at the lap pool on the 28th floor that will float between the towers, and also checked out the insane views from the roof. POLL: Will Amenity-Filled Skybridges Become a New Architectural Trend? 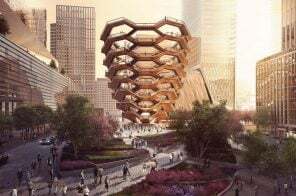 When the SHoP Architects-designed American Copper Buildings were first revealed, it wasn’t as much their twisting silhouettes that made headlines as it was their diagonal, amenity-filled skybridge. The three-story bridge, boasting a lap pool and lounge and topped with private terraces, is located 300 feet above the street, the highest such structure in the city and a new concept in enticing residents to the luxury market. And just this week, Bjarke Ingels unveiled new views of his High Line towers, which will feature two skybridges. Though they’re much closer to the ground, they’re also planned as amenity spaces, which makes us wonder–is this architectural feature set to become a new trend in NYC? Today is the day for big reveals at the American Copper Buildings. 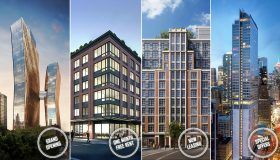 Earlier, 6sqft broke the news that the affordable housing lottery for the project’s low-income units will begin Monday (with homes ranging from $833/month studios to $1,247/month three-bedrooms), and now Curbed has shared the first interior renderings of the 761 apartments, as well as some additional amenity details. SHoP Architects, who designed the pair of dancing towers for JDS Development, are also responsible for the interiors, an unusual occurrence for the firm. They’ve outfitted the residences with 10-foot ceilings and floor-to-ceiling windows, and custom-designed oak floors, kitchens, lighting, and shades. 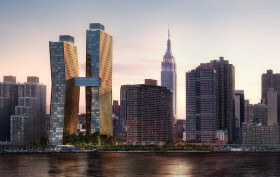 One of the flashiest new residential projects on the horizon is the American Copper Buildings, the SHoP Architects-designed dancing towers along the East River that have become best known for their three-story, amenity-filled skybridge, the highest such structure in the city at 300 feet above street level. 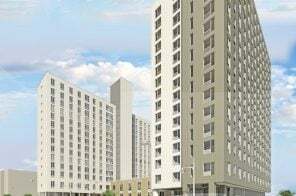 As 6sqft previously reported, when completed early next year, the shimmering buildings will offer 761 rental units, 20 percent of which will be earmarked for low-income households. This latter group of 160 apartments has now officially come online through the city’s affordable housing lottery, ranging from $833/month studios to $1,247/month three-bedrooms.